How was the disciplinary debate about the city, which informed the great urban expansion in Portugal, before and after the April 1974 revolution? In what way were architecture and urban space discussed, when the lack of housing was a central problem, and throughout Europe post-war city was already being questioned? These issues set out the framework for the development of a research based on the two main journals in the country at that time, Arquitectura and Binário. This paper synthetically presents it, focusing on the debate, theorization and the way ideas were presented. 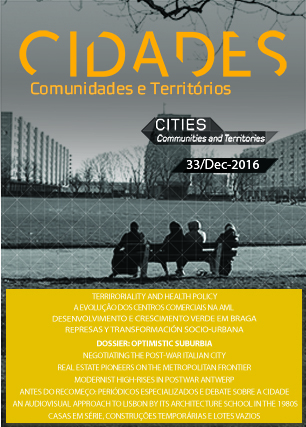 The subject is considered relevant by its relation with the transformation of the Portuguese city, rather than by the coherency and solidity of the body of ideas, the organization of different lines of thought or any innovative approaches. It is therefore important to understand how and what ideas were debated or presented, that is, to perceive the context in which urban project was developed. The novel moment of post-revolution, in particular, in which the whole society’s organization was questioned and all possibilities seemed open, whole and clean, was also a new start for architects, committed in creating the physical space for the new era and the renewed society. The reflections, ideas, models or theories that were used to support design, given the urgency of the moment and the need for fast response requested by the spirit of time, had already to be formed, being partly the result of the context of disciplinary debate here analyzed.